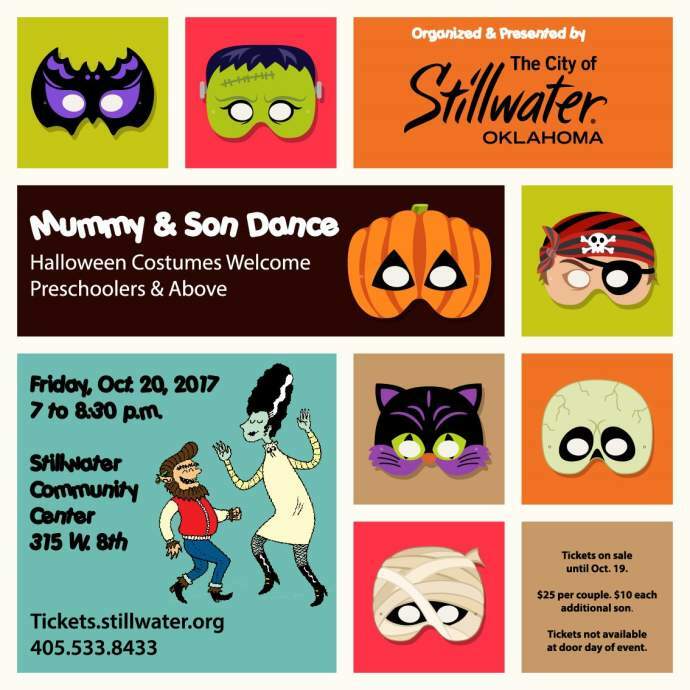 (STILLWATER, Oklahoma / Sept. 1, 2017 ) — Get your dancing shoes, masks and costumes ready for the Mummy and Son Dance on Friday, Oct. 20 from 7 to 8:30 p.m. at the City of Stillwater Community Center, 315 W. 8th Ave.
“Join us at the Community Center for a spooktacular evening. Ghosts, goblins, super heroes and moms are all welcome," Community Center Manager Stephanie Kinder said. The Community Center will be decorated for a fang-tastic time as attendees dance, make a craft and enjoy popcorn and a movie with mom. Tickets are required and are available starting Sept. 1 until Oct. 19 They are $25 per couple and $10 for each additional son. Tickets are not available at the door the day of the event. You may purchase tickets online or at the Community Center. To purchase tickets for the dance online, go to tickets.stillwater.org. This event is organized and presented by the City of Stillwater. For more information, contact Stephanie Kinder at 405.533.8433 or email skinder@stillwater.org.